Thank you so much for a very fair review of my book. Very few folks seem to be looking for anything other than genre fiction these days, and lacking any pre-teens, vampires, zombies, or whatnot, Crawford County often leaves them flat. Only one correction, however…it’s Janikowski with a final “i”, rather than “y”. Polish, rather than Ukrainian. A very small price to pay for a great review, though. Thank you again for your accurate work and fair treatment. Thanks, Tom. Sorry about the y–even copyeditors need copyeditors. I wouldn’t worry too much about readers who only read genre fiction. There are still plenty of literary fiction readers who just haven’t picked up on your book yet. Give them time. Really, I don’t think the problem is an overabundance of zombies but rather serious problems with distribution and promotion of titles that aren’t expected to sell in the bazillions. I have been haunting the handful of literary podcasts that feature small press titles–Brad Listi’s Other Ppl, for example–and keeping one eye on Electric Literature, to try and stay informed of interesting new works. Genre readers have extravagent candy shoppes bursting with zombies that cater to their buying habits; people looking for something in the literary way are driven to the back alleys and flea markets of the bookselling world–it takes more work. 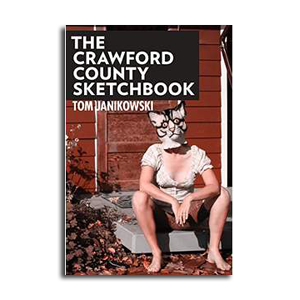 It seems to me Crawford County is more timely now than when it was first published. Give it a fresh push and see where it goes.